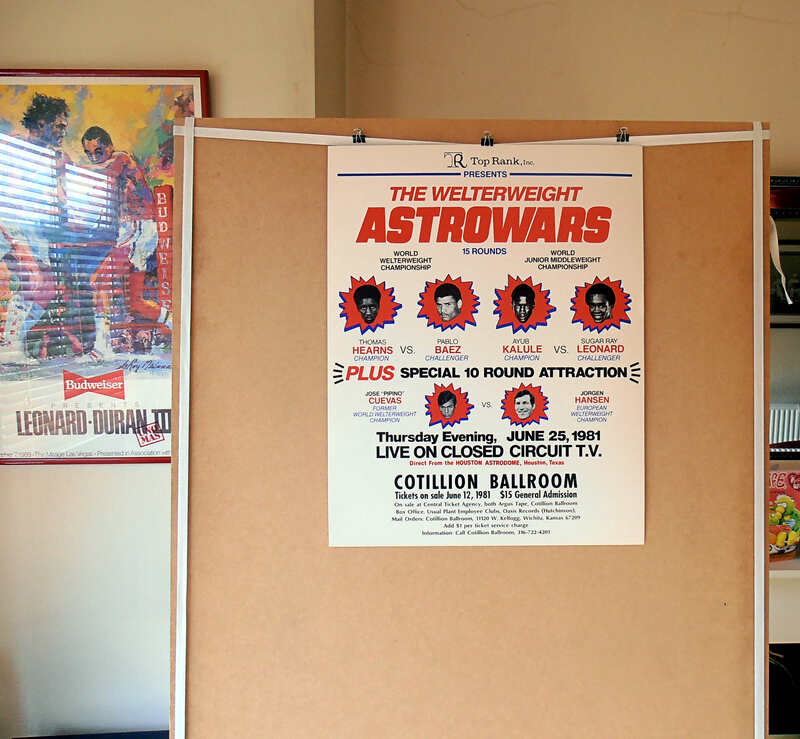 Description : Here we have a mega rare original official Top Rank Inc, closed circuit boxing poster. 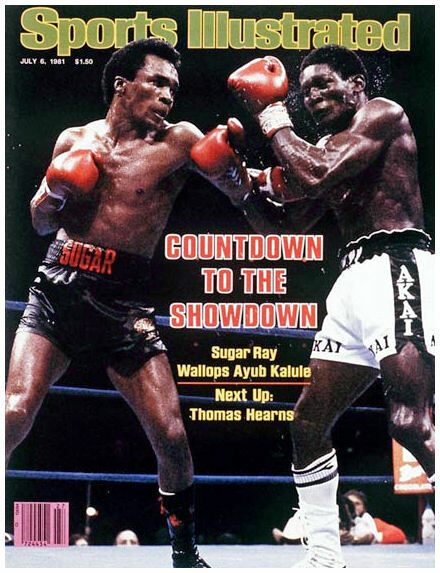 Sugar Ray Leonard moved up to the junior middleweight division and faced Ayub Kalule on June 25, 1981 at the Astrodome in Houston, Texas. 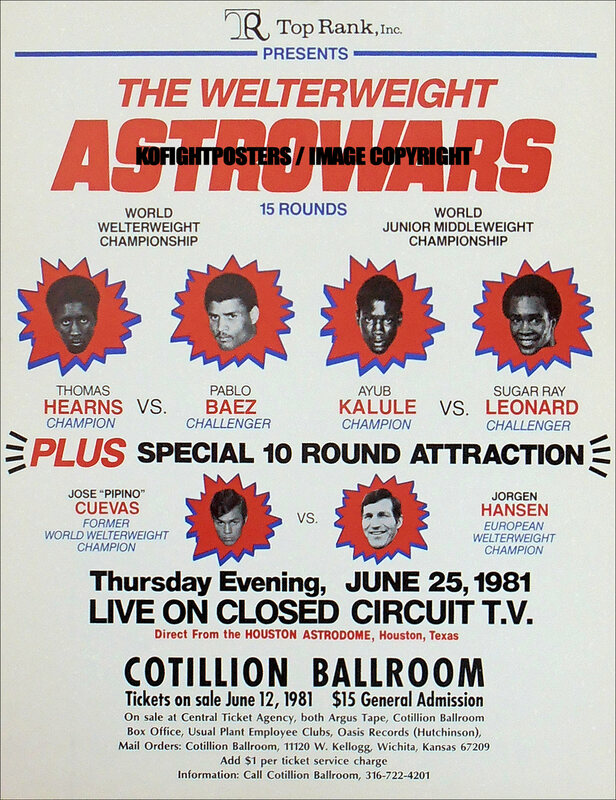 Kalule, who was 36-0, had been the WBA Light Middleweight Champion for the past two years. Kalule and his handlers had expected Leonard to use lateral movement against him, but Leonard took the fight to Kalule. After eight tough rounds, Leonard was ahead although Kalule appeared to have taken leonards best efforts to get him out of there & was now coming on strong in the 8th & 9th rounds. Just at the end of the 9th round Leonard finally hurt Kalule with a right to the head & shortly afterward, Leonard dropped him with a flurry of punches of do or die punches. Kalule got up but the referee waved it off. Leonard celebrated his victory with a full 360-degree, no-hands flip. Despite an official stoppage time of 2.59, the fight was actually stopped at 3.06 into the round, meaning Kalule should have been saved by the bell. Postage: £35.00 Parcelforce48...£55.00 International registered signed 4 airmail. Condition : Excellent/produced on quality stockcard/SHIPPED FLAT.